Past penned Frederick Lesort opened AvroKO designed, Plein Sud recently at The Smyth Hotel in Tribeca. The Southern French fare restaurant and Bar a Vin, wreaks of taste and potential. The atmosphere is lavished with elegant, yet simple bars perches overlooking the street and comfy chic style banquettes span the dining room. Chef Ed Cotton’s menu headlines an array of Gallic Classics like; Coq au vin, Croque Monsieur, Charcuterie,Boeuf Bourguignon and Pâté et Terrines. Of course there’s a burger as well, and big surprise it’s a Pat La Frieda! Le Burger Royale au Fromage, or Royale with cheese, is an 8 oz. Black Angus soft centre oozing of creamy white cheddar and propped on a shiny toasted brioche bun. Oh! And the piste de résistance is a slather of decadent black truffle aioli. Plein Sud is connected to the Thompson Hotel Group’s newest venture the Smyth Hotel, they have delicious coffee and many other bistro-esque delectables. The kitchen is open at 6am for breakfast, on the weekend brunch menu you’ll find ” trois” le ouefs Benedict variations, and a trio of breakfast flatbreads…..”Life is like a box of chocolates” but with this one, you know what you’re gonna get! After forty years of deterioration, Harlem’s population began to see a speedy increase sociocultural changes in the late 1990s. This was due to a change in federal and state laws and policies, including a concerted effort by local crime fighters to clean up, and wash out the bad element that plagued the area. In 1994, when the city began supplying funds for the area, it increased the property value rapidly to approximately 300% today-even President Bill Clinton moved in. Despite all of these positive changes the folks in Harlem have had little to experience as far as fine dining goes, maybe a fried chicken leg or bowl of collards-not that was a bad thing. Finally 5 and Diamond Restaurant has arrived, a neat modest little restaurant serving a loud and exciting menu, complete with a mouth-watering fat-back burger, to a culinary starved and growing neighborhood. Chef de cuisine David Santos, told me “The neighborhood was really crying out for a good brunch/dinner place, people are stopping me on the street and thanking me”. Chef/Owner Ryan Skeen, of such restaurants as Resto,The General Greene, Irving Mill and Allen and Delancey, teamed with local Harlemer’s Lia San Filippo and Selene Martinez to open 5 and Diamond. After some reality show worthy controversy, the team seems to be on a smooth, less dramatic course. The brunch menu is a touch of Southern home comfort featuring; Cornmeal Griddle Cakes with banana walnut butter,Yogurt Granola with fresh fruit, Buttermilk Biscuits with homemade apple butter, Tracy’s Canadian Fried Chicken, and David Santos’s Shrimp and Grits Hush puppies with smoked paprika aioli. The dinner menu was a solid Mediteranean/American feel,featuring Cavendish Quail and Liege Salad,Rabbit Sugo Parpardelle, 28 day Aged Creekstone Bone-in Shell Steak with roasted mushrooms,creamed Tuscan kale and tobacco onions. I sat in the window seat surrounded by a modern Japanese-esque style decor with antique style steel bay windows. There is a sleek counter bar where patrons can order from a bar menu highlighting Grilled Prawns with Papa’s Fritas and Gruyere and Mimolette Mac n Cheese. The Pat Lafrieda burger,was perfected by Skeen at his last venture, and is carefully constructed with a 60%/30% blend of beef cheek, bavette and pork fat back-which is ground on-site daily. This “heart stopper” was a gorgeous, 6 oz creation slathered with luscious white cheddar cheese, fresh homemade vinegar dill pickles, red onion and lettuce-all stacked on a char-soft potato bun. I started with a tasting of the Buttermilk Biscuits with creamy-fruity homemade apple butter, which were divine. The Shrimp and Grits Hush puppies followed, with smoked paprika aioli-these “puppies” were crispy and delectably fantastic ! The Yogurt Granola with plump strawberries and blackberries was fresh and delightful. After this bevy of pleasure it was burger time, the pork-beef beast arrived open-faced with duck fat fried home fries in tow. I carefully stacked the green leafy lettuce and crunchy dill pickles into a towering impressive looking sandwich. The first bite was juicy and bloody, pork fat back ran over my hands as my eyes rolled back in my head, my thought was, ” These guys are onto something here ! ” The burger flavor was salty, robust and aromatic, accented by the tartness of the vinegar dills and a buttery potato bun. The fries however, were not my favorite, tasting kind of stale and greasy. The 5 and Diamond burger was definitely one of my favorites in the city, for the hearty eaters there is a Texas Burger version with fried egg and bacon that sparked my interest too-maybe next time. 5 and Diamond, is worth the trip North, so if you’re the type that thinks that there’s no treasures above 59th Street, slip on your loafers and grab a taxi to Harlem. The bad element that was once part of this hood, is transforming into young urban yupsters with an appetite for Noveau chic cuisine. The tasting menu that showcases Sea Urchin,Seafood Tagliatelle, Rabbit and Ratatouille Sausage Spaetzle, Duo of Lamb and Spiced glazed Doughnuts is a steal at $50 with wine pairing $85.00. Thank-you to Chef David Santos and Ryan Skeen for making my brunch-“a spa experience for my mouth”. I grew up in Australia,which is a fanatical, tea saturated country and the idea of having a spot of tea in the afternoon was in-bred in my psyche at a very young age. Sanctuary T located in swanky cocktail and espresso laden Soho, is a testament to the wonders and flavors of the world’s best teas. Owner Dawn Cameron and Chef Kenn McGoey have created a spa-salon like tea temple complete with potable and non-potable versions of the ancient leaf. The decor is dark wood modern, panelling with an open floor plan and outdoor bay windows facing busy West Broadway. I was welcomed by manager Kermit and his band of tea servants and given a perch right in the window with the aroma of 50 brews of tea wafting through the air and I immediately fell into a tranquil state,as I tried to concentrate on my friends excited chatter. The menu features typical brunch fare with a European twist, also known for tea infused creations such as Salmon Poached in Red Moon Tea, Halibut slow cooked in Lychee Black Tea and Smoked Turkey Eggs Benedict infused with Pear Cinnamon Tea. The burger on the menu, which used to be a slider, recently was promoted to a fines herb seasoned patty served on a towering sesame freckled brioche with blue cheese and roasted tomato. I sipped a refreshing goblet of Iced Rose Tea, and observed several people seep in the Zen like atmosphere, possibly concocted by the Long Island like version being readily served. My burger arrived sitting appealing on a plate with a side salad, although to my disappointment it was cut in half, thereby undoubtedly letting the beautiful juice run out on the plate. I took my first bite and was welcomed with a rich aromatic herb flavor, followed by a storm of creamy blue cheese and roasted tomato. The bun was lightly toasted and perfect, I thought the overall flavor of the patty was impressive, but lacked in succulence and juiciness. It wasn’t a large burger,reflecting kind of spa like persona about it. Not that this was a bad thing, but something to be aware of before visiting. For those of you that are famished, I would recommend coupling this one with a heaping helping of tea infused French Fries. Prices are Soho marked, and you should call for a reservation to avoid waits. The staff are friendly and cordial, and are the type that will do their best to make your experience special. To replicate your tea flavor experience in your home kitchen, be sure to grab a souvenir of some of their ingenious T Dust Tea Seasoning on your way out. After a burger tasting planned for a well-known burger haunt fell through, I walked aimlessly and annoyed that my burger craving was postponed and prolonged -“What else is in this area” ? I asked myself “Minetta Tavern”, “Five Guys” ? Not willing to deal with the waiting and unsure chance of getting a table at Minetta, or needlessly following the hordes of burger reviewers that flock after Five Guys, I was lost for ideas. Reluctantly I decided to expel my idea of a burger mission, and just go to a normal brunch, perhaps giving my arteries a rest -and maybe order a salad? I noticed that there were swarms of people outside Jane, an American bistro and sister restaurant of The Smith, a partnership of Glen Harris and Jeffrey Lefcourt. I asked myself- “Could this have a decent burger”? I quickly scanned the crowded room hoping to catch a glimpse of other burger fanatics nourishing themselves on my unsuspecting prey. I noticed a guy, about to devour this surprisingly gorgeous specimen, and I was sold. I approached the maitre’d and asked for her next available table, then lounged on the front bench basking in the welcomed sunlight that was beating down on the city. The menu at Jane consists of your usual brunch/lunch favorites: Caesar Salad, Eggs Benedict, BLT and Vanilla Bean French Toast, the latter of which is supposedly their signature. The decor is modern contemporary with wide panoramic windows and comfortable banquette’s along each wall, the scene is a retrospect of Soho-fashionistas meets NYC students, with some restaurant savvy tourists thrown in for good measure. My party and I were seated in the back of the packed dining room. Excitement suddenly came over me that I had found a great new burger place, my hopes of being the first to discover this new burger find, were dashed when I noticed on my handy Google App , that every man and his dog had reviewed the place! Happily there weren’t too many distasteful slurs, so I felt confident that we were in for an unexpected treat. The burger was slated on the menu simply as “Jane Burger” with white cheddar, double smoke bacon, special sauce and fries. After careful interrogation of the waitress, I found out that there was a creamy mayonnaise based jalapeno marmalade and tangy green pickled tomatoes hidden in there also. The burger arrived, and was gargantuan! Served on a fat brioche bun with crispy french fries and cheese oozing out the side-I was a happy camper. My first bite was powered by the smokiness of the bacon, and crispy dill flavor of the pickled tomato. This was a novel and inventive alternative, capturing the flavor of a tomato and a dill pickle together. The beef was 100% ground sirloin, that was dripping with juices which quickly ran down my hands and forearms, like a rapid river. This was good in a way, because it told me that the burger was juicy and full of flavor. However it also told me, that my last bite could likely be dry. The flavor and texture was above average and I enjoyed it immensely, savoring every bite, unfortunately the last few bites were definitely dry, and drained of juices. This tiny detail may seem trivial, but previous giants of the burger world have been known to avoid this paltry dilemma. Jane restaurant is the perfect place to enjoy good decent brunch fare, while shopping in Soho, or maybe before catching a frou-frou artistically saturated film at the Angelika ? On the weekend expect to wait 10-15 mins. for a table, but if it’s a nice day you can work on your tan, take your mind off the stresses of life, and gawk at the brunch searching masses walk by, undoubtedly on the hunt for something fabulous and ever so popular. 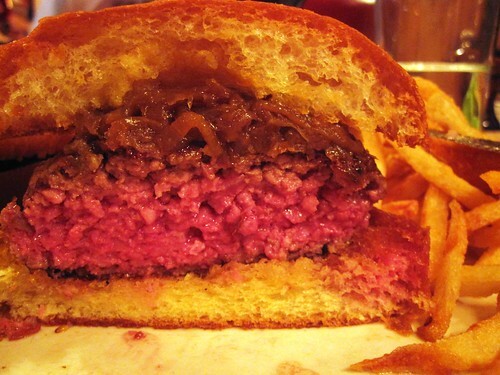 Well next time you’re in Soho and on that same hunt, the DMANBURGER say’s “look no further than Jane”. Finally the wait is over, well nearly! Chef Jeremy Spector, accomplished culinarian of past eateries as Employees Only, Dogmatic Dog and Gramercy Tavern, heads up the helm at this British inspired restaurant, nestled in the East Village. I got the scoop, from a confidential burger source a couple of weeks ago, that a goliath meaty sandwich was going to appear on the menu for brunch to challenge this gotham of burger architects. The Brindle Room is the brain child of Chef Jeremy and CIA graduate Dean Piccolo, a beef fanatic, and owner of Sebastians Steakhouse in Morristown New Jersey. The Brindle room is a charming, cosy little Gastropub-like spot, serving a variety of fare with a small menu made up of three parts-spreads,small and large. The reason for this is to ensure an easy transition to seasonal and daily changes. Some features on the menu consist of a traditional Lancastrian speciality Potted Shrimp, Crispy shredded pork bellies with warmed spinach, and Roast Chicken with root vegetables in porcini jus. The restaurant is drowned in pleasant dark tones and has a feel, reminiscent of an old English ale house, featuring a Starck-esque wall length banquette, wooden stools and warm lighting. I sat at the small counter/bar in the rear, and chatted to Chef Jeremy as he prepared a 9 oz patty, hand blended daily by Sebastians Steakhouse. The meat elements included aged trimmings of Short Ribs, Filet Mignon, Skirt and Rib-Eye. He pan-fried it in a seasoned cast-iron skillet, till char brown and juicy, assembled it in front of my eyes with a simple bun (soon to be Pain D’Avignon), creamy soft Stilton cheese, and earthy herb flavored caramelized onions. Perched in front of me with a generous bed of crispy hand-cut french fries, I wasted no time sampling this beautiful beast. The flavor was rich and powerful ! A mouth-watering succulence, mixed with full-bodied velvety taste of the Stilton, and slight tones of earthy herb and spice from the onions. The French-fries were perfect, crispy and salty. And to add a little” je nais se quoi” it’s also offered à cheval-with a fried egg. The burger will open to a popular following in two or three weeks for brunch, or maybe you can pull up a bar stool like I did, and chew the fat with Chef Jeremy Spector and he might give you a sneak peek ? who knows? you may just have the luck of the Irish! or… is it the British?? Whatever! go and check out The Brindle Room and find out for yourself, you won’t be disappointed. Around the corner from Freeman’s, the taxidermy laden, clandestine tavern that has been repeatedly reviewed by food paparazzi over the years lays the charming cafe/restaurant -The National. Opened by Jeremy Hogeland and partner Julie Dickstein 7 months ago, they have dodged the press radar relatively well, a tactic to achieve their excellence before the hordes of foodies sunk their teeth in, literally! I was interested to learn that the namesake was inspired by Hotel Nacional de Cuba, featured in Godfather II .It was the real-life La Cosa Nostra meeting spot for charismatic hoods Meyer Lansky and Lucky Luciano, back in the 40′s, and also featured in Godfather II. Jeremy informed me that his personal vision was to practice their “schizophrenic like” menu, which was jointly created by him, Julie and Chef Zoe Feigenbaum, and incorporates endless international eats and inspirations. The decor is cafe style cozy, scattered flea market trinkets and adornments, mother of pearl shades, antique mirrors, with the Cubano style name sign splashed high above with floor to ceiling white surgically clean subway tiles that plaster the walls. Oh –by the way – if you are wondering where the tables that you are eating on are from- none other than Meyer Lansky’s old haunt- Lansky Lounge! The National originally opened as a cafe, so hence I decided to sample the expert young barista’s handy work, that was hurriedly serving cap’s and latte’s to a fashion forward crowd at her tiny mini coffee bar. The coffee was insanely good, with just the right amount of foam to put a smile on my face on this gloomy afternoon. The space was tight, but I had adequate room at which to perform my burger surgery, seated in front of the door, I glance around at the crowed dining room filled with Euro hipsters and East Village type style mavens, undoubtedly stopping for some quick sustenance before browsing through over highly priced duds and haircuts and next doors Freeman’s Sporting Club. French Culinary Graduate, Chef Zoe Feigenbaum at the helm, and was busy creating in the kitchen, a selection of tasty brunch treats such as Shrimp and Grits, Lobster Roll, Jerk Pork, Fish Tacos and Banana French Toast. 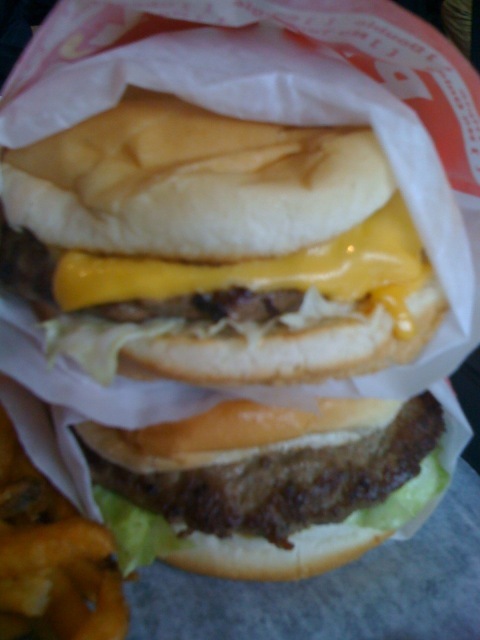 Zoe’s contribution to my appetite today was The National burger, an 8 oz. Pat La Frieda blend burger, served with colossal chunks of Smokey blue cheese, slabs of rosy red tomatoes on a toasted brioche. Jeremy Hogeland explained to me that their genius method of pan-frying the burger in a cast iron skillet, than broiling it under the Salamander, seals the juices and makes for a tenderer succulent patty. My plate arrived with a gorgeous looking specimen of burger handy work, winning top marks for looks alone. The chunks of blue cheese had a subtle coating of bronzing, just ever so slightly tanned. The brioche bun was delicately toasted with the right amount of give, when poked with my finger. The French fries were cut in exact symmetry and crispy to the taste, with a generous burst of herb after flavor. The patty itself was juicy, plump and charred to perfection, as I gorged into this delicious burger, I really tried hard to find something wrong with it, but I just couldn’t!! I thought it was pretty much as close to perfection as a bistro style burger gets, just as Lucky and Meyer were the mastermind’s of crime, The National was this day the mastermind of the burger. I also tasted the Fish Tacos which were crispy fried little pieces of Cod, adorned with zesty pickled cabbage, Pico de Gallo and a homemade tortilla. I can tell you as a Taco fan, these babies rated high on my list for some of the best I have ever had! The National is a charming place for a coffee, brunch or dinner, with an evening menu that some say surpasses its more famous neighbor. So if you’re growing old waiting in line for a Freeman’s table, stop that insanity and dine at The National! !